Perennials [subshrubs], 6-80 cm (usually rhizomatous, sometimes fibrous rooted or taprooted; usually aromatic). Stems 1(-4+, clustered), usually erect, branched mostly distally, glabrous or sparsely to densely lanate (hairs usually basifixed). Leaves basal (often withering before flowering) and cauline; alternate; petiolate or sessile (bases ± clasping); blades (cauline equaling basal or slightly smaller distally) linear to oblong-lanceolate, usually 1-2[-4]-pinnately lobed, ultimate margins entire, abaxial faces sparsely to densely lanate, adaxial faces glabrate to sparsely tomentose. Heads radiate [discoid], in compact to open (± flat-topped), simple or compound, corymbiform arrays [borne singly]. Involucres campanulate to hemispheric, mostly 2-3(-5+) mm diam. Phyllaries persistent, 10-30 in (1-)2-3(-4) series, oblong, ovate, or oblanceolate to lanceolate (midribs conspicuous), unequal, margins and apices (pale to black) scarious. Receptacles usually flat to slightly convex, rarely conic, paleate; paleae membranous, ± folded (sometimes each with central resin duct). Ray florets  3-5(-12+), usually pistillate and fertile; corollas usually white (laminae yellow at bases), sometimes pale yellow to pink or purple (tubes ± flattened), laminae orbiculate to suborbiculate (becoming reflexed). Disc florets usually (5-)15-75+, rarely 0, bisexual, fertile; corollas white to grayish or yellowish [yellow, pink], tubes ± flattened (bases ± saccate, clasping apices of cypselae), throats ± campanulate, lobes 5, ± deltate. Cypselae obcompressed, oblong to obovate (margins sometimes winged, apices rounded); ribs usually 2, lateral (sometimes plus 1 adaxial), faces glabrous (pericarps with myxogenic cells, sometimes with resin sacs; embryo sac development monosporic). x = 9. Centers of diversity for Achillea are in Europe and Asia. Achillea ageratum, A. distans, and A. ligustica have been reported as occurring in North America. Labels on herbarium specimens examined indicated that those reports were based on cultivated plants; there is no evidence that any of the three has become established in our flora. 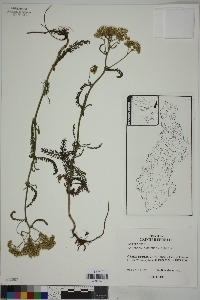 Achillea filipendulina may be persistent or established in California (F. Hrusa et al. 2002) and in Michigan (E. Voss 1972-1996, vol. 3). Achillea includes aromatic herbs with diverse vegetative morphologies. Floral characters show much less variation. Some species are widely cultivated both in Eurasia and North America. Interspecific hybridization has made identifications difficult and has evidently contributed to long lists of synonyms for some species. Plants of Achillea contain secondary metabolites with purported therapeutic and pharmacologic uses. Native Americans used the plants to treat earaches, diarrhea, and hemorrhages. Heads radiate, the rays 3-13, pistillate and fertile (rarely neutral), white, sometimes pink or yellow, short and broad; invol bracts imbricate in several series, dry, with scarious or hyaline margins and often greenish midrib; receptacle conic or convex, chaffy; disk-fls mostly 10-75, perfect and fertile; style-branches flattened, truncate, penicillate; achenes compressed parallel to the invol bracts, callous-margined, glabrous; pappus none; perennial herbs with alternate, subentire to pinnately dissected lvs and several or many relatively small heads in a ±corymbiform infl. 75, N. Hemisphere, mainly Old World. In addition to the following spp. [A. ptarmica; A. sibirica; & A. millefolium], A. tomentosa L., 2-4 dm, with bright yellow fls, casually escapes from cult.